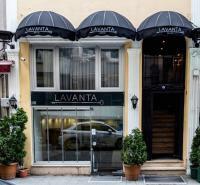 Chakra Suites is a brand new studio residence located in a quiet environment in the heart of Istanbul. Equally appealing to tenants looking for either along or short term local experience in the city centre, Chakra Suites is close to many great attractions such as Dolmabahça Palace, Cevahir, Kanyon, Metrocity and Akmerkez Shopping malls, the Bosphorus Bridge and Taksim Square. The coast of the Bosphorus is a few minutes away and the old city, Sultanahmet, another popular location especially for tourists, is only 8 kilometers away. For long term guests, staying at Apartman means not having to deal with monthly fees and bills, cleaning, and the dreaded daily search for a parking spot. If you choose to stay for a shorter term, you can benefit from the comfort and the services that will make you feel home while taking care of your every need as in most of the other hotels. Peradays is located in the historic district of Beyoğlu situated on the European side of Istanbul, Turkey.The area was known as Pera from the Middle Ages up until the early 20th century and is the most active art, entertainment and night life centre of Istanbul. Originally built in the 19th Century, the Peradays building was converted into a first class boutique hotel featuring all the modern comforts one would expect plus many more. All Rooms in Best Western Istanbul Saint Sophia Hotel are equipped with air-conditioning, satellite tv (about 1,000 channels), minibar, direct dial phone, free wireless internet connection, hair dryers, iron and ironing table, and bathtub. You have great views of the ancient city from selected rooms. You can watch the historical Saint Sophia Museum, Topkapi Palace, Blue Mosque, or the national park, from your room while enjoying your complimentary coffee and tea. Rooms are equipped with air-conditioning, satellite tv (about 1,000 channels), minibar, direct dial telephone, internet connection, hair dryers, iron and ironing table, and bathtab.You have great views of the ancient city from all our rooms. You can watch the historical Saint Sophia Museum, Topkapi Palace, Blue Mosque, or the national park, from your room while enjoying your complimentary coffee and tea. Sura Design& Suites Hotel is located in the Sultanahmet district,which still protects their authentic historical beauty all through the challenging years. Sultanahmet was once a place to watch the chariot racing and social while the area ignite with many enterainment and some politcal discussions. This is where you'll find all the great and important architectures such as Topkapı Palace, Ayasofya (Hagia Sophia), the Blue Mosque (Sultan Ahmet Camii), the Byzantine Hippodrome, Yerebatan Sarayı (Basilica Cistern), Binbirdirek Cistern, the Istanbul Archeological Museums, Great Palace Mosaic Museum, and several lesser sights.It's the best location for sightseeing in Istanbul. Visit Sura Hotel, experience the convenience and comfort designed for you, enjoy what the city offers. Hotel Perula was built in Historical peninsula of Istanbul in 2011 with the concept of luxury boutique service and contains sections of classical and modern architecture. Sultanahmet Square, Hagia Sophia, Topkapi Palace,Blue Mosque, Basilica cistern and the covered bazaar is 5-10 minutes walking distance to hotel perula. 30 luxury and comfortable rooms, a rich variety of excellent buffet breakfast, tradational Turkish bath and personalized service has adopted the philosophy of service above the expectations. Perfect location 5-10 minutes walk from Topkapi Palace, Hagia Sofia Museum, Blue Mosque, Basilica Cisterns, Spice Bazaar, Hippodrome, and ferry station at Eminönü which will take you to the Asian side or on a Bosphorus cruise. Transportation is easy to the rest of the city, 3 minutes walk brings you to the tram to Taksim. Make a start to your day with the seasonal products of your complimentary breakfast and prepare yourself for the long day with refreshing ingredients served. Relax in your climate controlled room with free Wi-Fi, room service, satellite TV, minibar, and complimentary water, coffee and tea. The multilingual staff (English, French, Spanish, Portuguese, Italian, German, Albanian and Russian) is available to help you with reservations, bookings, transportations, or anything else you may need. In Orient Express Hotel reception is also there to inform, listen and help you 24/7. Experience the Ottoman style luxury and world famous Turkish hospitality at the exceptional Ottoman Hotel Park while finding a peaceful respite from one of the liveliest cities in the world in our luxurious, spacious and modern rooms combining past and present in a relaxing atmosphere The most demanding leisure and business travellers leave with memorable experiences following to their stay at the Ottoman Hotel Park. Though only minutes from the city’s iconic landmarks, Ottoman Hotel Park has the tranquillity of an oasis with its location and interior design. With deluxe, superior and standard rooms decorated in a postmodern Ottoman and Turkish theme, Ottoman Hotel Park is dedicated to make your stay a comfortable, relaxing and unforgettable experience. Spacious rooms offer high-speed wireless internet access, LCD flat panel TV with satellite, bathrobes and slippers, hygienic and orthopaedic beds, individually controlled air conditioner, digital safe box, direct phone, mini-bar and coffee-maker. Designed in traditional shaving set, toothbrush, loofah, personal care set, bonnet, special soaps and gels, make up mirror, hair-dryer and telephone. Ottoman Hotel Park is situated in the heart of the historic peninsula of Istanbul, 10 minutes walk from the iconic Istanbul landmarks such as Hagia Sophia Museum, the Blue Mosque, Topkapı Palace and the Basilica Cistern. Although being in the heart of all the important attractions, the hotel is located in a quiet district, in Kadırga, which is only 14 km far from Istanbul International Ataturk Airport and 49 km away from the Sabiha Gokcen Airport which is located on the Asian side of Istanbul.